Kuzushi - particularly in the context of the connection exercises we call releases, and with particular emphasis on answering the question, "How can you tell if you have kuzushi or if you have enough kuzushi that you can safely and efficiently execute a technique. Bode's Tactical Aikido - some of J.W. 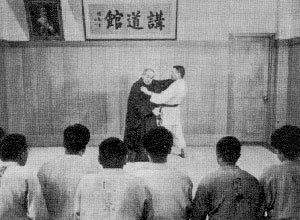 Bode's ideas about using releases to enter into techniques from both aikido and judo. Merritt Stevens' Tactical Aikido - Ten techniques selected by Sensei Merritt as forming the basis of a quickly-learned, easily-retained self-defense system. Whit will be demonstrating the Yellow- and Green-belt curriculum for both aikido and judo. Knox and Quin will be demonstrating the first three sets of Nage no Kata. Looks to be well-attended, and promises to be a load of fun! be there or be square!